Hi, the british one is now updated (Sept./Oct.). Search for lego store near London and check store details, you can then download it. Offers are the same for Germany etc. as far as I know apart from purchase needed (£50 or €55). Lego Ninjago 30422 until 22th September and London Bus 3rd to 22nd October. Also any idea where we will have double VIP pionts? What month is double points. That's handy - two different freebies under the double points period. Not sure I want the holiday countdown calendar, but double points plus bus for the Caterham sounds like a deal to me. Would the £10 off and free london bus not be better for the Caterham than double points? Wondering whether there's a risk of [email protected] running out of London Bus by the time of double VIP points? ^^ depends if you can have a discount twice as I had £10 off the mini cooper last week. Plus need to wait a couple of weeks to put the next purchase onto next month's credit card bill! There was an error/change on the online newsletter - the Duplo promo isn't the puzzle set listed but is the My First set #40167. Magda(?) at CS very kindly looked into it for me & saved me a wasted trip or two this weeken. What would be the cheapest Nexo Knights product? One of those from the "Ultimate" line? Seems like you really need to order a set to qualify for the promo; it doesn't seem to work with the Nexo Night keychain. So cheapest way to get it would be with one of the Ultimate sets. Might be worth waiting until Friday to be able to stack a free Nexo Knights Kings Guard, London Bus and double VIP? Although I already made sure to buy something earlier to get the London Bus. Didn't want to risk waiting for the 14th only to miss out if stocks ran out. a battle pack is probably a bit more expensive but you would have a little army of king guards. Until Dec 18 free delivery from EUR35 instead of the usual EUR55. Might be useful if you don't have any large sets in mind to qualify for the Gingerbread Man/Rebel A-wing Pilot promotions. When I put for EUR42 items in my shopping basket, it does list the EUR5.95 charge in the My Bag drop down. However as soon as I go to Checkout, shipping is listed as Free. Did you try that? Eur5.95 shipping Charge?!? We pay Eur11.95 in IRELAND! If its like the GB website it's for VIP members. .. are y'all signed in? + it makes me think of all these characters in the town Sweetwater, and very impatient to see the next episode of Westworld. Anyway, back on topic, I chucked a set in my basket, and everything seems fine here. However if you want the snowglobe #40223 you have to spend €65, so forget about that €35 free shipping deal, cause it won't get you the Christmas gift. Are there really people here on BS who are not a VIP? We are all VIP's aren't we?! Yes, I noticed, but I thought it could not hurt to reiterate that fact. Nonetheless thanks for providing all this useful info, I am very grateful you did so, otherwise I had not known about the A-Wing pilot poly so far in advance. I did not turn that word 'sweetwater' into a hyperlink, I don't know what feature on this site prompted it to get turned into one, as I did not even know there was a website bearing that name! [email protected] is out of Gingerbread Man, but starting tomorrow you get double VIP points on all purchases. Promo runs until December 26. #5004408 Rebel A-wing Pilot when spending EUR30 or more on Star Wars is also still available. The 2017 wave 1 SW sets are now also available to order, except #75175 A-wing Starfighter for some reason. I went to a German store today, spent about 65eur on pick-a-brick, got double VIP points, the snowglobe set and the gingerbread man. Guess it's not out of stock everywhere and the previous promo is still going. Yesterday I went to the Lego Store in Wijnegem (Antwerp, Belgium), and I received the same goodies as Sven_F. Minifig, snowglobe and double VIP points. They stil have snowglobes and the SW minifig though. They did run out of snowglobes also on the 17th. That's unfortunate, I guess the poster on the other forum snagged one of the last ones then. I hope Lego has something else to give away then. At the opening of the store in London they were literally throwing old stock of the 2015 Gingerbread House into the crowd. Maybe they saved a box or two for Antwerp? No #30524 Mini Batwing like the US (yet?). Also still 30% off any Retiring Soon labelled sets they have still available. Except BE/FR due to (TLG's interpretation of) local laws. 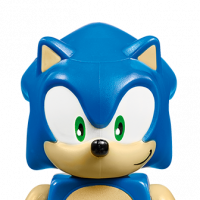 No exclusives though, so you can likely find these cheaper elsewhere anyway. TLG seems to have run out of the Disco/Clown Batman poly. Wish I had a lego store here. Looks like you can cross all these promotions on the 13th (except for points). Nothing on the March-April EU Store Calendar about double VIP. Doesn't mean we will not get any, but not announced yet. Looks like we are getting double vip March 6th to 16th? Anyone know what March Pick a model will be in store? My dad will be in belgium over the weekend and I'm sending him for a large pab cup (hoping they have 2 x 4 bricks in dbg- just spent 30 minutes showing him how to stack them :) ). Also if anyone has a recent video/picture of the stores contents it would help a lot and be much appreciated! 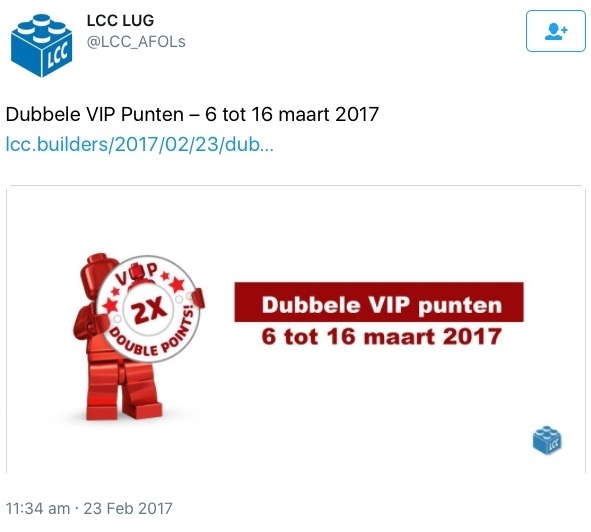 Triple VIP is until 23 April, as confirmed by @iso3200 by calling a Lego Store. does that mean 8 sets will be 40% off? I expect it will be old buildable figures.